OMAHA, Neb. 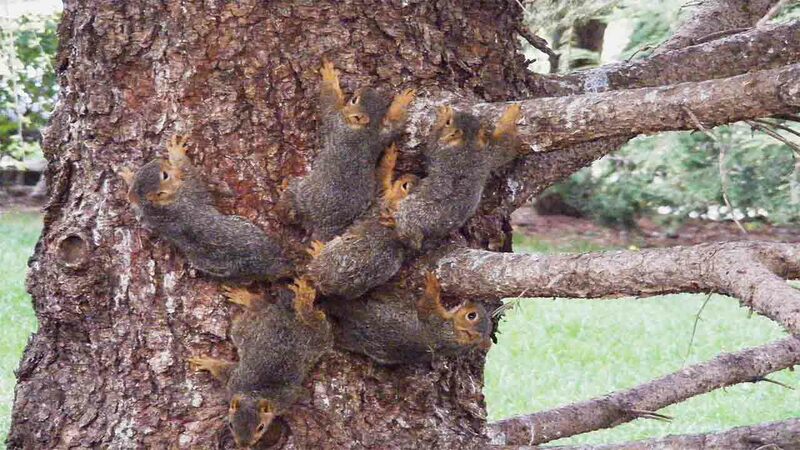 -- Six young squirrels whose tails were stuck together by tree sap are recovering after a Nebraska wildlife expert untangled them. A Nebraska Humane Society worker rescued the squirrels from a pine tree in Omaha last week. Nebraska Wildlife Rehab executive director Laura Stastny told the Omaha World-Herald that the sap-covered tails became knotted as the youngsters wrestled in their nest. Stastny says they are about 8 weeks old. Resident Craig Luttman spotted the rodents' predicament, describing it Thursday as "kind of like a tug of war, going in completely opposite directions." Stastny gave the squirrels a mild painkiller before removing the sticky fur and untangling them. She says some of them suffered injuries to their tails, but that she expects all six to be released in a few weeks.